Located in California's East Bay, the John Muir Chapter of Trout Unlimited strives to provide information that is relevant to our members and anyone interested in the conservation issues that concern our watersheds. How many Chinook Salmon runs are there anyway? California streams support the southern-most Chinook salmon runs on the west coast. Chinook salmon in California display a wide array of life history patterns that allow them to take advantage of the diverse and variable riverine and ocean environments. Chinook salmon are “anadromous” fish, migrating upstream as adults to spawn in freshwater streams, and migrating as juveniles downstream to the ocean to grow and mature. The time spent in the ocean and freshwater varies greatly among the various runs. At least seventeen distinct runs of Chinook salmon are recognized in California . These runs have been classified into six major groups, or Evolutionarily Significant Units. The Southern Oregon and Northern California Coastal Chinook salmon ESU includes fall-run Chinook salmon in coastal streams from Cape Blanco in Oregon south to the Klamath River. Southern Oregon and Northern California Coastal Chinook salmon were proposed for federal listing in 1999, but listing was determined to be not warranted. The California Coastal Chinook salmon ESU includes all; naturally spawned populations of Chinook salmon from rivers and streams south of the Klamath River to the Russian River, California, as well as seven artificial propagation programs: the Humboldt Fish Action Council (Freshwater Creek), Yager Creek, Redwood Creek, Hollow Tree, Van Arsdale Fish Station, Mattole Salmon Group, and Mad River Hatchery fall-run Chinook hatchery programs. Due to concern over depressed population sizes relative to historical abundance, California Coastal Chinook salmon were federally listed as threatened in 1999. Fall, late-fall, and spring-run Chinook spawn and rear in the Trinity River and in the Klamath River upstream of the mouth of the Trinity River. In the Trinity River, Chinook salmon spawn in the mainstem (with their upstream distribution limited by Lewiston Dam), the north and south forks, Hayfork Creek, New River, and Canyon Creek. In the Klamath River, Chinook salmon once ascended into Upper Klamath Lake, Oregon, to spawn in the major tributaries to the lake (Williamson, Sprague, and Wood Rivers), but access to this region was blocked by Copco Dam, built in 1917. Today Chinook are known to spawn in the mainstem Klamath River, Bogus Creek, Shasta River, Scott River, Indian Creek, Elk Creek, Clear Creek, Salmon River, Bluff Creek, Blue Creek, and the lower reaches of some of the other smaller tributaries to the mainstem river. Upper Klamath – Trinity River Chinook salmon were proposed for federal listing in 1998, but listing was determined to be not warranted. Four distinct runs of Chinook salmon spawn in the Sacramento-San Joaquin River system, named for the season when the majority of the run enters freshwater as adults. Fall-run Chinook migrate upstream as adults from July through December and spawn from early October through late December. The timing of runs varies from stream to stream. Late fall-run Chinook migrate into the rivers from mid-October through December and spawn from January through mid-April. The majority of young salmon of these races migrate to the ocean during the first few months following emergence, although some may remain in freshwater and migrate as yearlings. Fall-run Chinook are currently the most abundant of the Central Valley races, contributing to large commercial and recreational fisheries in the ocean and popular sportfisheries in the freshwater streams. Fall-run Chinook are raised at five major Central Valley hatcheries which release more than 32 million smolts each year. Due to concerns over population size and hatchery influence, Central Valley fall/late fall-run Chinook salmon are a Species of Concern under the federal Endangered Species Act. Four distinct runs of Chinook salmon spawn in the Sacramento-San Joaquin River system, named for the season when the majority of the run enters freshwater as adults. Spring-run Chinook enter the Sacramento River from late March through September. Adults hold in cool water habitats through the summer, then spawn in the fall from mid-August through early October. Spring-run juveniles migrate soon after emergence as young-of-the-year, or remain in freshwater and migrate as yearlings. Spring-run Chinook were historically the most abundant race in the Central Valley. Now only remnant runs remain in Butte, Mill, Deer, Antelope, and Beegum Creeks, tributaries to the Sacramento River. In the mainstem Sacramento River and the Feather River, early-running Chinook salmon occur, but significant hybridization with fall-run has occurred. Due to the small number of non-hybridized populations remaining and low population sizes, Central Valley spring-run were listed as threatened under both the state and federal endangered species acts in 1999. Four distinct runs of Chinook salmon spawn in the Sacramento-San Joaquin River system, named for the season when the majority of the run enters freshwater as adults. Adult winter-run pass under the Golden Gate Bridge from November through May, and pass into the Sacramento River from December through early August. Winter-run Chinook spawn in the upper mainstem Sacramento River from mid-April through August. Fry and smolts emigrate downstream from July through March through the Sacramento River, reaching the Delta from September through June. What's the Plan to Save Winter-run Chinook in the Sacramento River? NOAA has developed a "Priority Actions 2016-2020" document outlining their plans to try and recover this rapidly dwindling population. risk species because it is composed of just one small population that is currently under severe stress caused by one of California’s worst droughts on record. Over the last 10 years of available data (2003-2013), the abundance of spawning winter - run Chinook adults ranged from a low of 738 in 2011 to a high of 17,197 in 2007, with an average of 6,298. The population subsists in large part due to agency managed cold water releases from Shasta Reservoir during the summer and artificial propagation from Livingston Stone National Fish Hatchery’s winter-run Chinook salmon conservation program. Winter-run Chinook salmon are dependent on sufficient cold water storage in Shasta Reservoir, and it has long been recognized that a prolonged drought could have devastating impacts, possibly leading to the species’ extinction. Salmon in the McCloud River? Efforts to reintroduce winter-run Sacramento River Chinook salmon (Oncorhynchus tshawytscha) to the McCloud River and Battle Creek are underway. On the McCloud River, a pilot reintroduction feasibility plan is being developed by Bureau of Reclamation in collaboration with the USFWS, NMFS, CDFW, and DWR. This pilot plan will inform decision making for a possible long-term reintroduction upstream of Shasta Dam to the McCloud River. This is an excellent source of detailed information published by NOAA Fisheries West Coast Region on their website documenting the historic status and potential for Salmon and Steelhead recovery in the key watersheds throughout the Central Valley. Three years ago, only eight salmon were recorded in the creek. This year, an estimated 1,000 to 1,600 salmon are believed to be spawning in local Putah Creek waters below Solano Dam. Wild Klamath Mountain Province steelhead. CDFW photo by Jeff Weaver. According to a report published by PPIC, the best documented indicators of declining aquatic environments in California are fish (Moyle and Williams 1990; Moyle 2002; Howard and Revenga 2009). Of 129 kinds of native fish in California, 5 percent are extinct, 24 percent are listed as threatened or endangered species, 13 percent are eligible for listing today, and another 40 percent are in decline (Figure B). In other words, over 80 percent of the native fishes are extinct or imperiled to a greater or lesser degree. The number of imperiled species is increasing rapidly. Since the first state - wide assessment in 1985, fish species have been listed under state and federal Endangered Species Acts (ESAs) at a rate of about one species per year, with 31 listed by 2010. Most native fishes are endemic only to California (60 percent) or to the interstate waters of California, Nevada, and Oregon (19 percent). Thus, their decline is largely due to factors in California, mostly related to human water and land management. Clearly, environmental management actions in recent decades have been far from sufficient to reverse these declines. An analysis by Richter et al. (1997b) indicates that the loss of freshwater biodiversity in the western United States primarily results from altered hydro - logic regimes, pollution (especially nonpoint source pollution), and invasions of alien species. have naturally small populations exhibiting high susceptibility to risk from stressors that, if realized, could lead to declines that would qualify them for listing as threatened or endangered. Species accounts were prepared for the 62 taxa determined to be of special concern to address the following: overall status, description, taxonomic relationships, life history, habitat requirements, distribution, trends in abundance, nature and degree of threats, effects of climate change, status determination (scoring) and management recommendations. Maps showing current and historic range accompany each account. In many gold-mining areas where mercury was used, it is still relatively easy to find quantities of liquid elemental mercury in sediments and stream channels. Of even greater environmental concern is the presence of methylmercury, an organic form of mercury that is a potent neurotoxin and is especially detrimental to developing fetuses and children. Methylmercury accumulates and biomagnifies in the food chain, reaching highest concentrations in predatory fish such as bass and other species which are prized by anglers. Numerous water bodies in California have fish-consumption advisories because of mercury contamination from historical mining. Several of these advisories are based on data collected by the USGS, including those in Trinity County, and in the Bear, Yuba, and American River watersheds in the Sierra Nevada. For information on these advisories, see the web site of the California Office of Environmental Health Hazard Assessment. The Cache Creek watershed drains eastward from the north-central part of the California Coast Range. It includes Clear Lake, the largest and oldest natural lake located entirely in California. There are several historical gold and mercury mines in the Cache Creek watershed, including the Sulphur Bank Mercury Mine, which is a USEPA Superfund site, and the Abbott and Turkey Run mines which were recently remediated by the private sector. There is a mercury TMDL in place for Cache Creek and some of its tributaries, developed by the California Regional Water Quality Control Board - Central Valley Region. According to the USGS, Californians withdrew an estimated total of 38 billion gallons of water per day in 2010 (the most recent data year of their study), compared with 46 billion gallons per day in 2005. Surface water withdrawals in California were 25 billion gallons per day (67%), compared with 35 billion gallons per day (76%) in 2005. Groundwater withdrawals accounted for 13 billion gallons per day (33%), compared with 11 billion gallons per day (24%) in 2005. About 82% of all California water withdrawals were from fresh-water sources, compared with 72% in 2005. In both 2005 and 2010, about 74% of all fresh water withdrawals were for irrigation. 95% of all saline water withdrawals were for thermoelectric power generation, compared with 98% in 2005. Public supply: 16.6% (6,307 million gallons per day). Average daily gross per capita use was 181 gallons (total Public Supply withdrawals divided by population served). Self-supply domestic: 0.5% (172 million gallons per day). Average daily per capita use was 69 gallons. The 58 counties in California use differing proportions of water sources in the 8 (or less) categories. The United States is likely to see a continuation of the recent dam removal trend. An emerging need is to provide relevant scientific information about the physical, biological, and ecological responses of rivers and reservoirs to dam removal. Retaining specific details about removed dams will provide valuable information to those researching and making decisions on future dam removals. USGS has been tracking dam removal across the country. The interactive tool at this link allows you to zoom in to a particular site and scroll over for detailed information on the dam that was removed. Here's a great site to check out on recent and current water flow conditions on your favorite river before you drive those 5 hours to go fishing. Scroll over the dot marking the location that you're interested in and the local river name and flow data (graphed and current versus historical) will display. The "Real-time streamflow" map tracks short-term changes (over several hours) in rivers and streams. Although the general appearance of the map changes very little from one hour to the next, individual sites may change rapidly in response to major rain events or to reservoir releases. The map depicts streamflow conditions as computed at USGS streamgages. The colors represent real-time streamflow compared to percentiles of historical daily streamflow for the day of the year. This map represents conditions relative to those that have historically occurred at this time of year. Only streamgages having at least 30 years of record are used. WaterWatch (http://waterwatch.usgs.gov) is a U.S. Geological Survey (USGS) World Wide Web site that displays maps, graphs, and tables describing real-time, recent, and past streamflow conditions for the United States. The real-time information generally is updated on an hourly basis. WaterWatch provides streamgage-based maps that show the location of more than 3,000 long-term (30 years or more) USGS streamgages; use colors to represent streamflow conditions compared to historical streamflow; feature a point-and-click interface allowing users to retrieve graphs of stream stage (water elevation) and flow; and highlight locations where extreme hydrologic events, such as floods and droughts, are occurring. The streamgage-based maps show streamflow conditions for real-time, average daily, and 7-day average streamflow. The real-time streamflow maps highlight flood and high flow conditions. The 7-day average streamflow maps highlight below-normal and drought conditions. WaterWatch also provides hydrologic unit code (HUC) maps. HUC-based maps are derived from the streamgage-based maps and illustrate streamflow conditions in hydrologic regions. These maps show average streamflow conditions for 1-, 7-, 14-, and 28-day periods, and for monthly average streamflow; highlight regions of low flow or hydrologic drought; and provide historical runoff and streamflow conditions beginning in 1901. WaterWatch summarizes streamflow conditions in a region (state or hydrologic unit) in terms of the long-term typical condition at streamgages in the region. Summary tables are provided along with time-series plots that depict variations through time. WaterWatch also includes tables of current streamflow information and locations of flooding. What's the Delta ERP and what is CDFW's role? Improve or maintain water and sediment quality. As the ERP’s State implementing agency, CDFW’s primary role within the program is to fund and manage grant projects within the ERP Focus Area to address the ERP goals and objectives. In addition, CDFW staff coordinates and collaborates with other local, State, and federal agencies to address the ERP goals and objectives. How is water used in California? Water in California is shared across three main sectors. SOURCE: Department of Water Resources (2013). California Water Plan Update (Bulletin 160-13). NOTE: The figure shows applied water use. The statewide average for 1998-2010 was 79.8 MAF. Environment (40.5 MAF average) includes water for "wild and scenic” rivers, required Delta outflow, instream flows, and managed wetlands. Urban (8.3 MAF) includes residential, commercial, and industrial uses, and large landscapes. Agriculture (31 MAF) includes water for crop production. Net water use—i.e., the volume consumed by people or plants, embodied in manufactured goods, evaporated, or discharged to saline waters—is lower. The figure excludes water used to actively recharge groundwater basins (3% for urban and 1% for agriculture on average), conveyance losses (2% for urban and 7% for agriculture), and water used for energy production (less than 2% of urban use). This summary from Maven's Notebook provides an excellent overview of the major water sourcing, storage and distribution projects throughout the Golden State. California has built a water delivery infrastructure that is likely the most extensive anywhere on earth, capable of moving a drop of water that originates near the northern border all the way down south to the Mexican border. Through the development of this infrastructure, man has rearranged California's natural assets to meet societal needs, making the state unrecognizable from its pre-settlement history in the process. California's climate and hydrology are unlike any other in the nation, with variability and uncertainty the main characteristics. In an average year, the total amount of precipitation is about 200 million acre-feet; however, the actual precipitation can vary anywhere from 100 million acre-feet to 300 million acre-feet, depending on whether it is a wet year, a dry year, or something in between. About half of the precipitation will evaporate, be used by vegetation, or sink into the subsurface, salt sinks, or flow to the ocean; the remaining half, known as ‘dedicated water' is what is available for use in cities, on farms, for the environment, or to be put in storage. California has more than 1,400 named dams and 1,300 reservoirs that help with flood management, water storage and water transport. Hydropower from dams also provides a major source of electricity throughout the state and a source of revenue. Dams are owned, maintained and operated by federal, state and local agencies. Groundwater is also an important part of the state's water supplies, comprising about 40% of water used in an average year, and 60% or more in a drought year. But groundwater is very much location dependent: some communities have no groundwater and rely solely on surface water while other communities may have only groundwater; other communities rely on a mix of imported water and groundwater, and even some rely solely on imported water. California has been identified as the heaviest groundwater user in the United States, with approximately 16% of the nation's groundwater supplies being extracted from the state's aquifers. 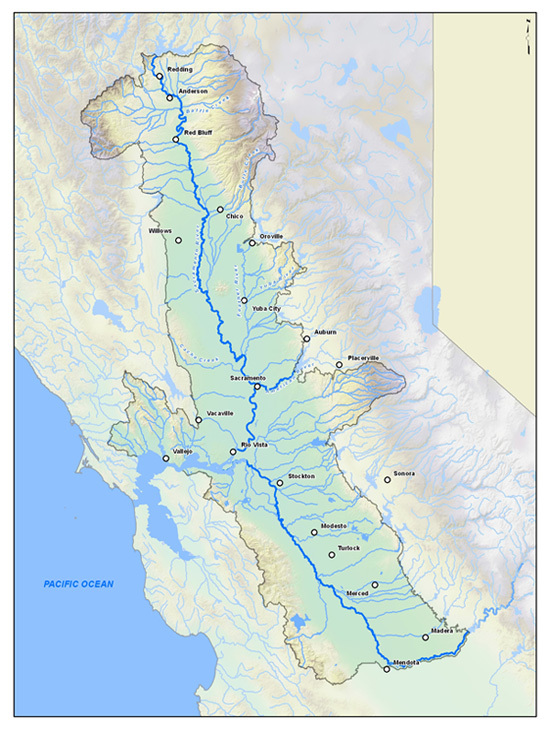 After studying the water flows needed for the recovery of chinook salmon and steelhead spawning runs in the central valley rivers for several years, the Water Board is recommending increasing flow on the San Joaquin River and its tributaries to a range of 30 to 50 percent, with a starting point of 40 percent of unimpaired flow from February through June. This is less than the 60 percent of unimpaired flow recommended by their scientific advisory panel. Unimpaired flow represents the water production of a river basin, unaltered by upstream diversions, storage, or by export or import of water to or from other watersheds. Historical median February through June flows from 1984–2009 in the Merced, Tuolumne, and Stanislaus Rivers were, respectively, 26, 21, and 40 percent of unimpaired flow. In other words, half of the time more than 60 or 70 percent of each river’s flow is diverted out of the river during these months.  Scientific studies show that flow is a major factor in the survival of fish like salmon and that current flows are inadequate to protect many endangered and threatened species, as well as species relied upon by the commercial fisheries. The Draft SED recognizes that other factors, like predation and loss of habitat, affect fish populations, and those factors are also addressed in the Draft SED.  The unimpaired flow requirement is designed to mimic the cues of nature that species have evolved to respond to, but is not intended to be a rigid and fixed percent of unimpaired flow. It is intended to provide a quantity of water as a baseline, but the proposal provides for, and encourages, collaboration to use the flows as a block of water that can be “shaped” or shifted in time to provide more functionally useful flows that provide increased habitat, more optimal temperatures, or a migration cue. This type of targeted effort can provide more timely and efficient use of flows than a set regime.  The Draft SED recognizes the financial and operational challenges to local economies of reduced diversions. The flow requirement considers the needs for fish and wildlife along with the needs of agriculture and local economies. This video developed by PPIC provides an overview of changes and challenges to the fragile Delta. As you know, TU’s cold water conservation efforts are epitomized by our work at the “micro” level to protect and restore habitat and trout and salmon populations. This work often is achieved through projects developed or facilitated by our chapters. TU also works at the “macro” level, primarily through our Science and Water program staff, to drive changes in policy and resource management practices that benefit fish – especially our native salmon and steelhead. Located in the East San Francisco Bay Area and comprised of members residing in Alameda and Contra Costa counties, the John Muir Chapter of Trout Unlimited recently held its first public, educational event on November 12, 2016. Partnering with Bay Nature Magazine, The East Bay Regional Parks District and members of the Oakland Casting Club, we held a half-day Introduction to Fishing Clinic. More than 40 attendees of all ages, mostly new to fishing, attended. Sessions on Stream Biology, Where to Fish Locally, Spin Casting and Fly Casting were popular among the participants who all got plenty of hands on experience in casting. A few of the attendees who had limited experience in casting were overheard to remark “now I know why it never worked for me when I tried it before!” Kids especially enjoyed handling the wiggly aquatic critters collected that morning from nearby Alameda Creek, and seeing the traveling aquarium of fish residing in our local waters that the Regional Parks District brought to this event. The more than a dozen volunteers who served as instructors got to hang out together for an after event picnic to get to know each other and talk about future efforts. We are planning to increase the work we do together with these local organizations to further participation in our new TU chapter and in conservation and public outreach in our local region.